Oftentimes, the signs that you are dealing with a pest infestation in or around your home are obvious. If you have bees, there might be a beehive, pigeons leave droppings, and if you are unlucky, a scorpion may sting you, or a cockroach may glare at you from the middle of the kitchen floor. But what about those pests that you can’t see? You think that doesn’t happen? Well, how about termites? Those pesky little bugs take a hold of your home way before you ever realize what’s going on. And they can cause some serious damage in the process. Many banks or lenders require a W.D.I.I.R ( Wood Destroying Insect Inspection Report) and for good reason. Studies suggest that termite property damage totals exceed $5 billion annually. Additionally, termites are five times more likely to consume your Arizona home than a fire would. Those are some unsettling numbers and worst of all, termite damage is usually not covered under a home insurance plan. So now what? To fight the “beast” you have to know the beast. Meaning, first you have to find out if you have a termite infestation in your home and then devise a plan of how to prevent future infestations. Why is the presence of termites a problem? Termites in Arizona eat the cellulose of your home’s wooden components. They don’t take breaks, they are active around the clock. Because they are hard to detect, you often don’t notice a termite infestation until there are obvious problems and by then the damage to the structure may already be quite substantial. Because they turn your structural wood into Swiss cheese, having termites is never a good thing, not for your structure and not for you. As mentioned above, termites can be hard to spot, because they eat your home from the inside out. Meaning, when they get started, you are completely unaware of what’s going on. However, the most important step to an Arizona termite prevention is to recognize the problem. While it is true that termites can be hard to spot, if you know what you are looking for and are observant, you may be able to detect the presence of those little buggers as early as possible. Because they eat your home from the inside out, they create tunnels in the walls, which in turn may cause your walls to sound hollow when you knock on them. For that reason, we often recommend using a screwdriver (or something similar) and tap the walls to listen for hollow sounding areas which could indicate the presence of termites. If you notice the appearance of “sawdust” on the base of wood and on floors, or if you see gaps between walls, those might be signs of termites chomping away on your home. The presence of mud tubes is another sign that you are dealing with termites. Mud tubes are basically “termite freeways” that lead from your property to their main colony. Termites have wings, but only until they reach their destination, then they discard them, which means you may find “leftover” wings near windows or doors. Bubbling paint or peeling wallpaper can be another indicator that you are not living on your own anymore. Regardless of what sign you may find that indicates the presence of termites, you should consult your experienced Gilbert termite extermination specialist to assess the extent of the problem and offer solutions that work. Termite infestations are not suited to try your hand at DIY pest control. Termites, like pretty much all insects, like it warm (yay Arizona has plenty of warm) and moist. Repair any water leaks stemming from old and deteriorating water pipes, faucets and other water carrying appliances. Rooting walls and damp floors make a great habitat for termites. Additionally, it is a great idea to clean and unclog gutters and downspouts to ensure that water is properly diverted away from your home. Damp soil is an invitation for termites to come on over and start breeding. Don’t forget about your air conditioner either. If it is leaking-have it fixed and make sure that the drain lines flow away from your structure. Splash blocks can be helpful in preventing erosion of the soil around your Arizona home. Make sure your irrigation system works properly. Leaking irrigation causes constant moisture and will attract termites and other insects. Even scrap pieces of wood are big enough for a colony to call home. If you have stacks of wood on your property, make sure they are several feet away from your home to prevent crossing over of the termites into your home. By trimming shrubs, bushes and trees and keeping them away from your foundation you are already a step ahead of the termites. Mulch should never be close to the house either. All of the above can create poorly ventilated, damp habitats that termites “dig”. Essentially anything that is touching your home and is made of wood has the potential to act as a gateway or bridge for termites to walk on into your home. This includes often overlooked items such as wooden fences that touch both soil and your home, or even planters whose plants connect with the home. You may also want to make sure that attics, basements and crawlspaces aren’t poorly ventilated or damp. Are your soffits, fascia or roof rotting away? Get them repaired as well to minimize the odds of termite infestation. If you suspect you are dealing with an Arizona termite infestation in your home or business structure, contact your licensed and experienced Arizona termite professional. Varsity Termite and Pest Control has been providing top quality termite inspections and treatment services to Arizona and surrounding cities for years. To get you started, we even offer a complimentary Gilbert termite home inspection. Contact us today to learn more about our Arizona termite services or to schedule your free home inspection and to protect your home. 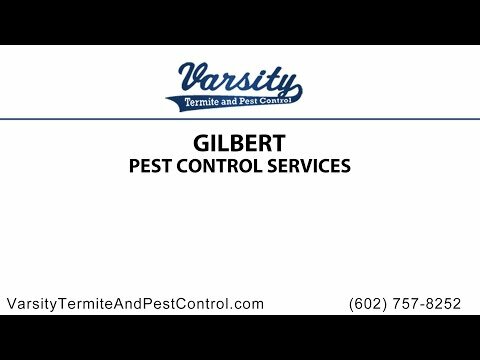 Call Varsity for all your Gilbert pest control needs!